Finally, the next installment of Noel and Issa’s tale is ready! Sorry it has taken me so long, but going right to publishing, before the story is complete, is dangerous. There is no taking back what you’ve already read, so now that we are officially in the thick of things, the crafting requires delicacy. Isabella’s jaw clenched, and she closed her eyes, searching the air for the melody of the silver hooded thrush, as she had been taught by the mothers when she was so small she could not yet sing the song of serenity. Fate would send a bird for her. It had to, she thought, trying to still her mind in its absence, to slow her breathing and let the calm come, but the urge to scream out was overwhelming, her chest tightening, the gravity of the world intensifying all around her. “I am the Waters of Fate,” she hissed the opening of first mantra, pressure building inside her head, the nerves in her body raw, stinging, as though an icy wind blew over them. “… born of peace embodied.” Her voice quavered with weakness. But tears burned against her flesh, tracing the hollow curves of her cheeks. Fate had forsaken her. Harvey was dead. All she had been taught, all she had spent her life pursuing—oneness with Fate, the grace of her own divine purpose as Fate’s steward— was a lie. “How can you feel so much betrayal without breaking?” she wept bitterly at the world, the knowledge of what it felt to be truly alive—a fragile, terribly human, lonely truth, filling her breast with the blood of a thousand passions—creeping like venom through her veins. As she lay weeping, the love song of the tiny bird, somewhere in the distance, pierced through her quiet gasps, Fate calling her back to the fold, but too late. The Om she had known, the Fate to which she had once been devout, was a shadow now, darker than the deepest depths of Moag, a shadow full of broken promises, devoid of hope, bereft of meaning. Noel’s hand clutched compulsively at his side, and he quickly shook it out, rubbing his fingers together, keeping time with the slow grinding of feet on the gravel road behind him, trying not to think of her. He and his companion— or guard, depending how one chose to view the present occupation of the young man following him— had reached a stand of trees where the bright green, fertile drupe weighed heavily on the branches, promising a fat supply of almonds in just a few weeks’ time. A mile over, the air was crisp as early spring, the tempting scent of the snowy blossoms welcoming a plethora of crawling things, filling the sky with a tireless drone of industry. Here there was no nectar left to mask the earthen odor of the plantations. It was hot and humid as mid-summer, and all Noel could hear above the stolid silence was the call of a lonesome bird not far away, and the rhythmic schrpp, schrpp, schrpping of young Emanuel’s leather sandals against the grit of their path. Noel chuckled to himself, wondering that the simple act of a teenager was the only normal thing he had discovered in his nine days inside the mountain, and that somehow the young man’s persistence in quietly expressing his annoyance at his duties was comforting. These people might have looked primitive, living in their mud-and-stick hovels with unadorned simplicity, but they were clearly highly adept sorcerers of some sort, though exactly what sort and the extent of their capabilities remained to be seen. If— when— Noel found his way back to the Iron Bones to recount this wild tale, Phileas Foote would surely kick himself for missing the opportunity to witness all of this, to explore an untouched world, to learn how the people of this mountain manage such incredible feats. Foote definitely would have been the better man for the job, he thought, wiping the sweat from the back of his neck, rubbing it off on the side of the long tunic he’d been given to wear, so as not to draw attention to himself in his wandering. As for Noel, he was no explorer or great study, so he was not certain where to begin, or if he should have begun in the first place. It was not easy for him, being at the mercy of his hosts. The only way out of the mountain, as far as he knew, was back through the pitch black hell he had already fought to escape, and he did not plan on going back that way anytime soon, so for the time being, he was stuck. He did not figure it would do to displease the natives, nosing around, asking loads of questions, or by refusing to wear their native dress. He had steered clear of the inhabited areas, as Edward Frank, the Ma-ah-dri-eem (or head Knowledge Keeper, as Noel liked to think of him) had requested, giving the old man the time he said he needed to sort out some more pressing matters, before he could concentrate all of his attention on Noel, but it had been days, and Noel doubted his taking care not to interrupt the puritanical lives of these people was necessary. When he was around, no one seemed to notice his presence, nor did they pay any mind to Emanuel as the two of them went about the business of exploring the place, while Noel surreptitiously searched for another, less treacherous exit. It was as though people looked right past him, and that was hardly the most curious thing about the inhabitants of Namcha Barwa, he thought, sticking his hands in the pockets of his tunic and casually waving it forward and back to foster a breeze, wondering how he was going to convince Emanuel to let him trek off through the orchard toward the false horizon, in search of another tunnel out. Noel frowned, looking up the road to find Master Frank, smiling genially as always, as he made his way down the path toward him, pale hands folded gently at the waist of his own knee-length shirt, white as the gossamer hair that framed his tender face. Noel glanced back at Emanuel. The teen’s brow was deeply furrowed, the glimmer of oil on his copper flesh lending him the look of an artist’s sculpture, shining in the magical morning sunlight. As they met in the road, the boy gave a small bow, and the old man nodded pleasantly. “Time… Er… It is… early in the day to see you,” Noel answered. He had been a guest in the elder’s hut since he arrived, but he usually only saw Edward Frank around sunset, when he returned for the evening from his more pressing matters—if one could call it a sunset, as it was all just a very realistic illusion, as far as he could tell. The two of them had parted company that morning, a little more than an hour before, when Noel and Emanuel had set out on their daily excursion, and he had not expected to see the old man again until late in the day, when they would have a quiet dinner together and sit for hours, talking circles around the matters that mattered to Noel, before it was time to sleep. “At last, the inquest,” Noel muttered in English, looking back to make certain Emanuel was still with them, as he was no longer scuffling his feet, since his elder had joined them. Aside from Master Frank, Emanuel was the only person Noel had interacted with in his days inside the mount, though the boy never spoke a word to anyone in their time together and rarely offered Noel a smile. Even so, while all he knew about him was that the lad liked to hear his feet walking, the fact he was there eased Noel’s mind. From the moment he first arrived, when Edward Frank led him to the tiny hut at the center of one of five quiet villages, sat down on the ground across from him at the low wooden table, the sole piece of furniture in the place, and offered him a cup of ginger tea, produced from thin air, Noel had known that eventually he would be forced to answer the myriad of questions the old man carefully avoided during their long hours of conversing. This waiting should have bothered Noel, if only because it was suspicious that immediate answers were not demanded of him, because that was the way the world worked when one turned up uninvited and unannounced, but there was a curious calmness that set in whenever Master Frank was around, and as a result, there was no talk about where the man who had rescued him was taken by the blind women, after they left the tunnel. There was no talk about the woman, Isabella, and whether or not she had survived after Noel resuscitated her. There was no talk of the darkness or what he had witnessed there. Noel was not certain, especially of the old man’s tranquility. After several minutes, they came out of the orchards, and as the path continued on in a subtle incline out of the natural valley where the food sources grew, the air cooled, and across a fallow field of violet thistles, sprung up wildly in defiance of the serenity of the place, Noel saw they were headed toward the river crossing, which he had not ventured near in nine days. There had been plenty of mountain to explore on this side, where the people carried on their lives, as though blissfully unaware that across the river, where the land was thickly overgrown with twisting trees, hidden in a sanctuary of sorts, surrounded by gardens, was a place no light could touch. “You are frightened as you have not been since the day you came to us, Young Noel,” Master Frank said quietly, even before Noel shivered. He squeezed his fingers together, numb warning pulsing within them. “No,” he lied, though he knew, if his voice had not shaken as he spoke, the old man’s empathy still could not be fooled by mere words. Like me, Noel thought, as the scraping of feet against the ground started up again, and he looked back at Emanuel, only to realize that the feet that were dragging were his own. The first two nights, Noel had barely slept. Every shadow echoed with mocking. Even now he felt the darkness linger, as though he carried the depths of it along with him, with every step. “The Felimi call it Moag. It is…” The old man paused, searching for the right words, and Noel looked over to see that his smile had faded. “The reflection of Om,” he finished, nodding in agreement with himself. In his long talks with Edward Frank, Noel had come to understand that the people living within the belly of Namcha Barwa worshiped the water, revering it as something of a creator-god named Om. According to their beliefs, the water that flowed there was the primordial force, the source of all, vibrating within the energy of everything, living and dead, animate and inanimate, through which all of the universe did manifest, and Noel supposed they were right to a certain extent, as water did play an important part in the creation of life, though their underground river was no Wangaar Dreamtime. They certainly weren’t the first tribal people to decide water must be a god of some kind, so he was not going to tell the old man that all the true gods died out more than ten thousand years ago, when Fate reared its ugly head and struck them down for their part in the Fall, or that all the world is left with is a bunch of demigods and memories of a time when actual gods did not need to trick people into worship in order to collect the energy of their praise. But while he doubted that this vibration within the water was the actual source of everything, he had also learned that these people believed the vibration was the source of their foresight and empathy, as well as another magic natural to some among them, called the Velhim, who had abilities he could not quite comprehend, except to say that they were able to tune the vibration of Om within others, which he imagined was what Edward Frank was doing to him at present, to keep him from running the other direction instead of continuing on the path to the bridge. As Noel was there seeking information about an ancient prophecy, and he could not deny the impact the old man had on him, with little to no effort, it was his duty to play along. But the idea of Om having a reflection did not make sense. He would have asked the old man to explain, but he did not want to talk about the darkness, let alone to return so close to the place where, reflection of the water or not, he knew, without a doubt, the darkness existed, where it tapped into his experiences, calling up the ghosts of his past and made him live illusions that were so real to him he could still feel them chilling his bones even now. He shook out his hand. God or no god, something was there in the darkness. It was not just the absence of light, the shadow of shadows one could expect buried under millions of tonnes of stone. He had seen it himself, living and breathing. He wondered if the old man had seen it too, but all he could do was swallow his pride and allow the silence to fill the space between himself and the bridge, as it drew nearer, with every step. “Young Noel, though you are reluctant, I must explain before we arrive at the cloister. Long ago the Felimi determined the best course of action was to keep the truth of Moag from our people, including we Mdrai,” the elder said quietly, speaking slowly so to give Noel time to understand. “For thousands of years, we have believed the labyrinth of tunnels that lead to the outside world were set with traps by our predecessors, to protect us from people like you, who come seeking foreknowledge, and dutifully we have avoided them. However, the events surrounding your arrival have brought the truth to light. Moag is not what we were led to believe. Moag is the opposite of creation. Within Moag, all are lost, unfolded into nonexistence. It is the dissolution of existence itself, and within it not even Om survives.” At these words, the elder paused, looking as grave as Noel felt as he continued along beside him in silence. Noel looked back at Emanuel, who seemed as curious that the leader would speak so candidly in front of Noel as Noel was that the leader would speak so candidly in front of the boy, but he was also surprised to find the boy was not frightened, as he should have been. “I do not want answers,” Noel said quickly, shaking his head. He did not want anything to do with the darkness. He did not want to ponder the idea that he had barely escaped absolute destruction. He did not want to talk about the possibility that his escape from absolute destruction had been allowed, even designed, however accidentally. He had only come there to understand the more than ten thousand years his people had spent waiting for the fulfillment of the Prophecy of the Last Hope, not to learn about Om and Moag, or to consider that in drinking Taree’s poison and entering the Dreaming back in Arnhem Land, he had simultaneously fractured the delicate balance of the universe and the delicate balance of power among the people hidden inside the mountain, but the truth of the matter was that is exactly what had happened, and he knew it, deep down at the soul of him, as surely as he had known that mountain was where he would find the truth about the prophecy. Phileas Foote would not have wreaked this sort of havoc. He was definitely the better man for this job, Noel thought, his fingertips stinging, harassed by the constant presence, not his own, burning hot, as the blood pounded through them, and he squeezed them into a fist, continuing on toward the bridge, clamping his jaw in annoyance, knowing Isabella had been inside the darkness as well, remembering the decay that had taken her arm and the sweetness of her lips, even as he tried to shake the memory of her away. 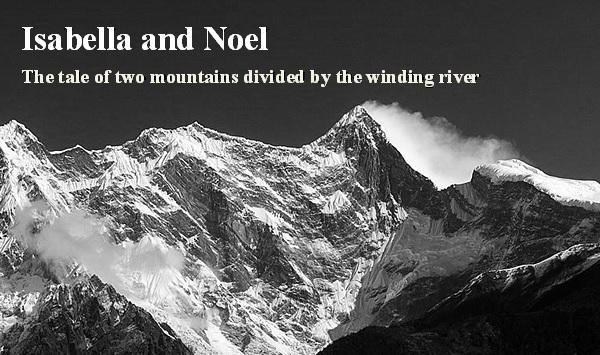 A few steps more and they reached the river crossing, where Noel stopped to look down at his fingers, red and irritated. The others said nothing, but continued on to the other side without him, not looking back, as though they knew he would follow them eventually. The Mardraim and Noel’s guard had already reached the twisting tree-line by the time Noel caught up to them. The cloister, carved into the mountain wall, was not too far away now, down the winding path that cut through the trees. “What do you want me to find out?” he asked as he reached Edward Frank’s side.